Fellow DOG lovers this badge is for you! 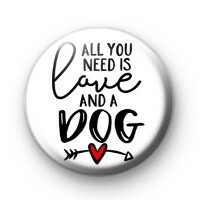 It is a white badge with fun black text which says 'All You Need is LOVE and a DOG'. Well, you know what they say dogs are mans best friend! So if you love your dog you need this badge pinned to your coat or bag. Make sure you take a look at our other dog-themed badges, we have quite a few canine designs to pick from.